Lamba Techno Flooring Solutions has always been offering new innovative solutions to its customers. 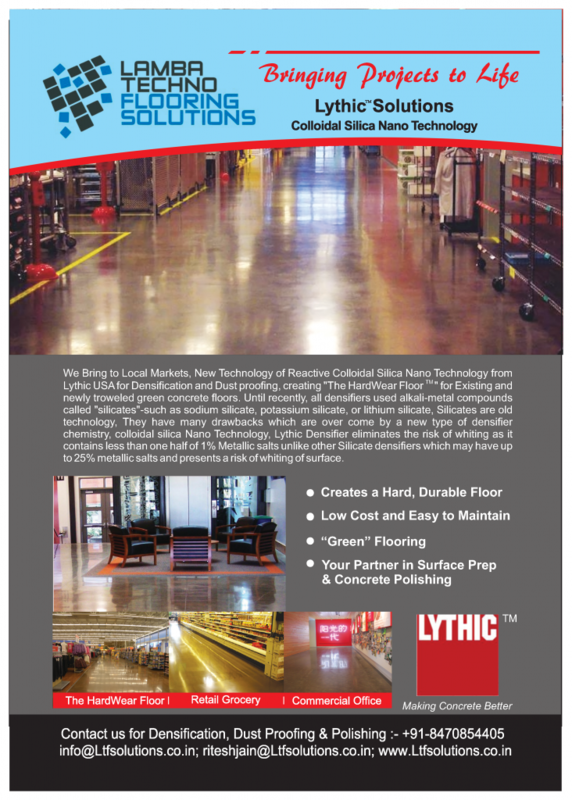 Now it has brought new technology of Reactive Colloidal Silica Nano Technology from Lythic USA for densification and dust proofing. 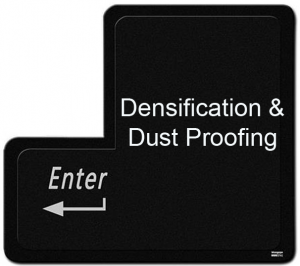 Dust Proofing, Product description Lythic Densifier is a blend of inorganic polymer materials that penetrates slab concrete to increase surface density and hardness. Utilising a proprietary and green manufacturing process, Its formulation of uniform, concentrated, Nano sized particles, suspended in an ultra low surface tension liquid, penetrates deeply into concrete surfaces bonding with the cement components of the slab. It makes an extremely hard, dense floor surface that has increased wear resistance to foot and fork lift traffic. It is water based and environmentally friendly and is VOC compliant in all states. It will help create hardwear floor for existing and newly troweled green concrete floors. Until recently, all densifiers used alkali-metal compounds called silicates, such as sodium silicate, Dust Proofing, potassium silicate, or lithium silicate. Silicates are old technology. They have many drawbacks which are overcome by a new type of densifier chemistry, colloidal silica nano technology. It is a new technology for better concrete. Reactive colloidal silica, nano-sized particles in an aqueous suspension, is 99.5 per cent pure silica suspended in an ultra-low surface tension liquid. The nano metre particles in their low v is cosity suspension penetrate quickly, deeply, and cleanly into concrete. Reactive colloidal silica also bonds to itself, a property not found in any silicate densifier. They react very efficiently with lime in concrete, making them far more reactive than conventional silicate densifiers. These reactions form cementitious compounds in the concrete’s pores that harden and densify the surface. Colloidal silica works by reacting with lime in concrete. During hydration, approximately 20 per cent of a concrete mixture’s portland cement is converted to lime, which has no structural value in concrete. However, colloidal silica pozzolanically reacts with lime to form CSH strengthening crystals. Concrete also contains naturally occurring silica. Because silica bonds best to itself, colloidal silica is able to build up more density and strength in a concrete surface. It can be applied to new, hardtroweled floors, or to existing slabs. • Reduces operating costs by increased ease of maintenance and cleaning. Lythic Densifier may be applied to newly installed concrete after final trowel while slab is still Green. Slab must be clean and free of all materials such as curing compounds, bond breakers, form release oils or construction Dust (Dust Proofing) and debris, etc. It can also be applied to concrete of any age. Surface must be clean and structurally sound. Surface also must be clear of membrane forming curing compounds, sealers, oils, dust and other surface contaminates. … Delivering Faster – Flatter – Floors for Future!